A review in 10 words (or thereabouts): There is a beauty in imperfections and hope in the darkness. 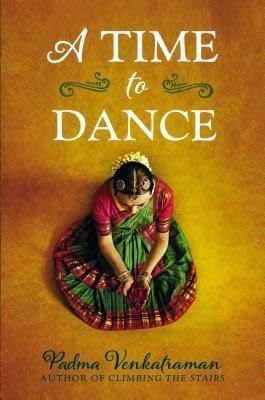 Veda, a classical dance prodigy in India, lives and breathes dance - so when an accident leaves her a below-knee amputee, her dreams are shattered. For a girl who's grown used to receiving applause for her dance prowess and flexibility, adjusting to a prosthetic leg is painful and humbling. But Veda refuses to let her disability rob her of her dreams, and she starts all over again, takin beginner classes with the youngest dancers. Then Veda meets Govinda, a young man who approaches dance as a spiritual pursuit. As their relationship depends, Veda reconnects with the world around her, and begins to discover who she is and what dance truly means to her. There was research that needed to be completed before fully understanding Veda and her love for dance. First, what in the world is bharatanatyam? The extent of my knowledge of Indian dancing comes from Bollywood movies. So there was extensive YouTube watching to immerse myself into the beauty of the dance form. And it is that. Beautiful. Those skilled at bharatanatyam not only use their body to express emotions, stretching and bending in impressive directions, but there is a focus on rhythm, subtle movements, and storytelling. So much of the dance has to do with balance, which makes Veda's passion and determination after her accident so impressive. Along with the dance itself, I had to look up Shiva. It had been years since I studied world religions in college, so I definitely needed a quick refresher. While Shiva has many forms, the Nataraja, or the dancing form of Shiva, is symbolic of the harmony of life, creation and destruction, life and death. Quite interesting when you think of Veda's life, death, and rebirth in conjunction with her accident. Veda is a strong, resilient young lady. While she grieves for the loss of her dreams, strong body, and hard earned skills, she preserves, learning humility and kindness throughout. She loves her family, even her mother who wishes for a different life for her daughter, away from poverty, and she opens herself up to love and friendship when they can both be hard, emotionally and culturally. Not only are you taken on a journey with Veda, but you get a glimpse into a different culture, a different world that appreciates beauty, spirituality, and respect. A solid read that works well as a novel in verse.